Height measurements can be obtained when a sensor model exists. Sun angle information is required to make measurements using shadows. The units for these measurements can be changed in the Mensuration Results pane. 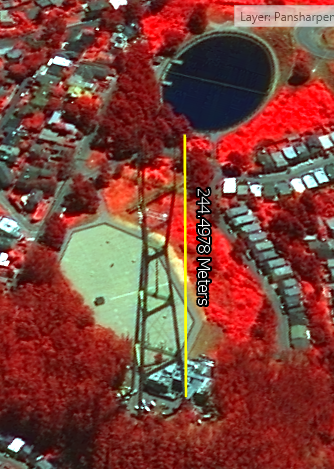 The best practice for height measurements is to collect them while in image space that uses an image coordinate system (ICS), since the image is not distorted in any way. ICS is supported in the ArcGIS Image Analyst extension, in the Image Space Analysis application. The Base To Top Height tool calculates the height of a structure by measuring from the base of the structure to the top. Measurements are performed perpendicular to the base of the feature; therefore, it is assumed that the building is not tapered or built at an angle. The line being measured along the building must have its top endpoint vertically above the base start point. 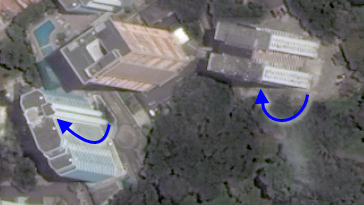 In the example below, there are several locations along each of these buildings where you can easily identify the base of the building and the location directly on the top. Click the layer in the Contents pane. In the Mensuration group, click the drop-down arrow that exposes the mensuration gallery and choose the Base To Top Height tool . Click a point at the base of the structure. Click the corresponding point at the top of the structure. Building height measurements are displayed in the Mensuration Results pane in user-defined units. The Base To Top Shadow Height tool calculates the height of a structure by measuring from the base of the structure to the top of the structure's shadow. The point in the shadow must represent a point on the structure that is perpendicular to the base. The calculation will be refined to account for topography when an Elevation dataset is defined in the Mensuration Options pane. In this example, the image has been enhanced to make the shadow more visible. Using the Base To Top Shadow Height tool, you can find the height of this lamppost by measuring from the base of the lamp to the top of the lamp's shadow. This is a better tool to use than the Base To Top Height tool because it is difficult to distinguish the top of the lamp in this example. In the Mensuration group, click the drop-down arrow that exposes the mensuration gallery, and choose the Base To Top Shadow Height tool . Click a point at the bottom of the structure. 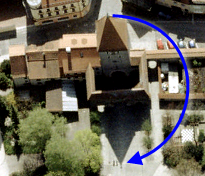 Click the corresponding point at the top of the structure's shadow. The Top To Top Shadow Height tool calculates the height of a structure by measuring from the top of the structure to the top of the structure's shadow. The points on the structure and its shadow must represent the same point. The calculation will be refined to account for topography when an Elevation dataset is defined on the Mensuration Options dialog box. In the example below, the point where the shadow intersects with the building (bottom of the shadow) is blocked by a tree; therefore, it should not be used. 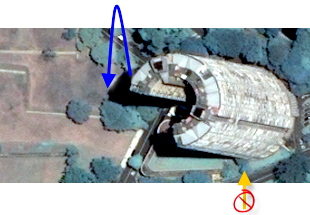 The correct way to identify the height of this building is to identify a point on the top of the building that can be identified in the top of the shadow, such as the one identified by the blue arrow. You may also use this tool if you need to measure the height of a part of the structure or the height of a structure that is not a rectangle. In the example below, the height of the pointed roof can only be measured from the top of the roof point to the top of the shadow, because you cannot discern the base point directly below the roof's peak. This tool is also useful for obtaining the height of an object on the top of a structure. For example, if there is a utility room on the roof of a building you want to measure, you can identify the top point of this feature in the image, and then identify the same point in the shadow. In the Mensuration group, click the drop-down arrow that exposes the Mensuration gallery, and choose the Top To Top Shadow Height tool . Click a point at the top of the structure. The mensuration tools provide interactive methods to measure the heights of objects in imagery. Check the Constrain direction of cursor movement for height measurement tools check box on the Mensuration Options dialog box to constrain the pointer movements when you make height measurements. The three height measurement tools operate such that the initial measurement point becomes the endpoint of a line for the constraint. The pointer will only move along the line that is appropriate for the measurement. For instance, when the Base To Top Height measurement tool is chosen, the first point should be the base of the object. The pointer movement is then constrained in the vertical direction. This is important when measuring objects where the location of the base is difficult to discern from the top of the object. For example, it may be easy to find the edge of the base of a pyramid type of feature, but difficult to determine the center of the base. There are also instances where other endpoints of the measurement are difficult to see, and the constraint can assist you in identifying them. 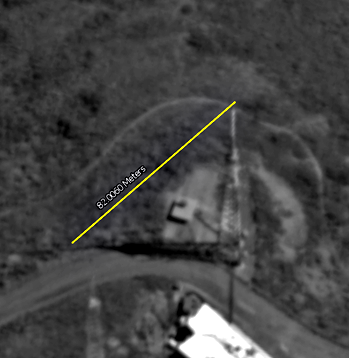 Constrained Base To Top measurement using an infrared image to discern the tower details against the vegetation. QuickBird-2 image courtesy of DigitalGlobe. For the Base To Top Shadow Height tool, the initial point should be the base of the feature. 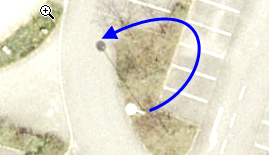 The pointer will then be constrained to move along the path of the shadow on the ground. For the Top To Top Shadow Height tool, the initial point should be the top of the feature. When active, it will constrain the pointer to follow the path of the sun rays that form the top edge of the shadow from the top of the feature. The measurement constraints are a convenient way to use the height measurement tools, and help you to collect correct measurements using the image's metadata.